It is the Christmas New Year break and the kids are home, and we as parents try and figure out what activities are fun to do together. Well I was on Facebook and noticed a post that told me our Nyack Library had free passes to the Museum of Natural History. I went over to the library and lo and behold this Facebook post was accurate. I was hoping for four passes, but their policy is two passes per family.which makes sense. Hey,when you are headed to the city with family everything helps to keep costs down. 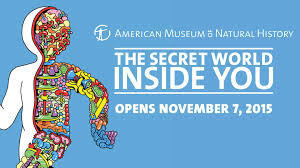 We saw a wonderful exhibition at the Museum of Natural History called The Secret World Inside You. The show is all about bacteria, and how it affects our bodies -really cool stuff. My oldest daughter wants to return this coming weekend. If you are looking for activities the family can enjoy together besides the proverbial movie this is your activity. After leaving the museum we were all famished and walked one block to Pizzeria Uno and had some awesome burgers, but the deep dish pizza looked wonderful as well. If you walk another block there is a Shake Shack. Enjoy! I think the exhibition closes in February so don’t wait too long.